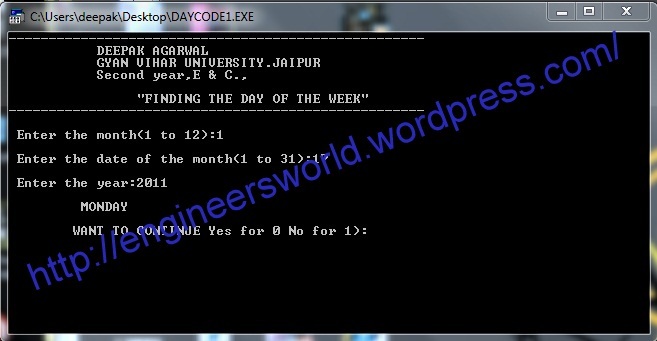 Here is the mine designed software of day finder,which gives you the correct day if you just enter the date on any year.It is completely designed in c language and if you want the code of the software you can mail me or write it here. http://www. WWW is referred to as Netsurfing. And it supports chatting, text, video and audio. The program’s premier feature is its whiteboard drawing utility. You can draw freehand, do circles, squares, lines, text, or paste image files to the canvas. This is ideal when users want to “sketch” concepts for one another. Users can interact publicly with everyone else on the server, or they can chat/draw privately using java Chat’s “whisper mode”. Users can create and manage chat rooms, which can be either “public” or “private”. The server will also store and manage answering machine-style messages for users who aren’t online, and instant messages can be sent to those who are. Additionally, users who aren’t watching their screens can be paged with sound.